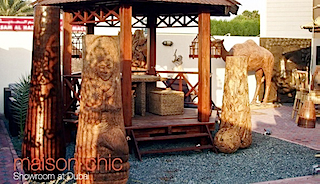 Furniture import in UAE at factory price, Handicraft, Decoration Accessories - Furniture direct import in the UAE - Hugh Stock available, with free delivery services. In the summer of 2007, after repetitive assessment trips, we have decided to establish and set-up two companies in the UAE, with the clear vision to offer a particularly unusual combination of different products to be introduced in this particularly vibrant and dynamic part of the world. From this initial pioneer spirit two companies were conceived. 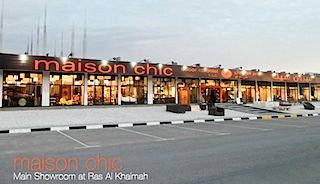 • maison Chic RAK FZE: oriented on the import/export aspect of the business. • Decor Colonial RAK LLC: the local distributor for the UAE. Our Warehouse is located in the RAKIA Al Hamra Free Zone, with a total lot surface area of 3600 m2 with the (1200 m2) covered surface is ideal as furniture storage facility. It is also geared to welcome professional wholesale buyers. We clearly benefit of the full support and adamant backing from our parent company PT. 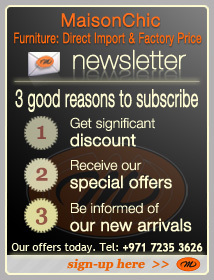 ALMI Furniture Perdana ( www.almifurniture.com ), based in Indonesia Java Island, with a huge experience in the sector. With in house research and development for creative trendy designs and new markets tendencies. ALMI Furniture has been producing and exporting furniture, handicrafts and decorative accessories for over 15 years in more than 40 different countries. Its production of an average of 250 containers per year is marketed through exhibitions in the most prominent professional fairs: Maison et Objects (Paris), IFFS (Singapore), IFFINA Jakarta (Indonesia), Dubai Index, ADNEC Home Style Show (Abu Dhabi). Our main objective and emphasis right now in the UAE is in general retail and wholesale (including re-exporting overseas from our base in RAKIA Free Zone). 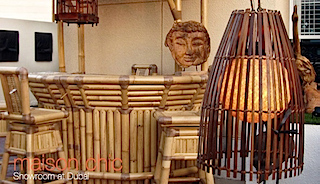 maison chic is specifically focused on handmade solid wood furniture made from teak, mango, jenkol, as well products like bamboo, rattan, banana leaves, water hyacinth, composing most of our exclusive collections. Our unique and distinguished handicrafts and decorative accessories products varies from assortment of wood, resin, composites, glass, mosaic items, mirrors, wooden/terracotta/resin products, statues, masks, totems, terracotta pots, hand carved metal, hand carved stone, original paintings on canvas, table/ambiance lamps, all presented to professionals and the public at a competitive price and pristine quality. We also supply excellent quality out-door items like gazebos, loungers, canopies, full sets synthetic rattan ranges for outdoor dining and relaxation at incredibly affordable rates. Ethnic style furniture (solid wood & bamboo), contemporary lines, leather sofas (from Italy/China) give us the flexibility to create any possible atmosphere in homes. Our new Docker Iron, Docker Wood and Docker Plate collections inspired by the transoceanic long haul travels embraces all our engagements on proposing a green furniture solution (in terms of recycling from an ecological point of view).These collections recently introduced are originally altered piece, with a fashionable agreeable final effect, all made from distressed wood, salvaged from old wrecked boats, in full apprehension of green concept values. The design combines modern and functional lines with usage of old materials blemished with rich history of thousands of past encounters. The base material principally utilized in the process is from drained mango wood, a sustainable fruit tree, timbered only once it stops bearing fruits. The cabinet doors, hardware & accessories are from solid brass metal, adding an antique distinctive trait boosted by the stickers reproductions of old fashioned luggage label casually fused on the outer layer of the furniture. 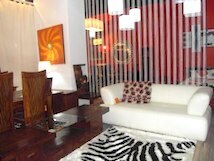 We also offer villas - flats furnishing - decoration packages at incredibly convenient deals. The global connection network instituted and created during the years has facilitated the outsourcing of extra complementary elements. Through our contacts in China, we have access and imported unique antique pieces that blends perfectly with a modern ambiance and produces outstanding feeling of charm and comfort. In this overall strategy we have not neglected the cozy fusion of selected Indian products as well, directly imported from the best reliable sources in Rajasthan. 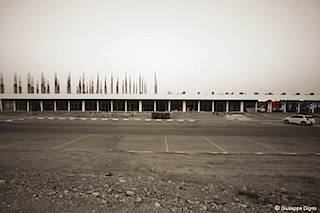 The Main Store in Ras Al Khaimah (1000m2) is opened for private buyers but aims as well at professional. All our exclusive ranges are properly displayed inside the showroom. The reason behind the choice of RAK: is the dynamism of the development of infrastructure (property developments, industrial boom, and friendly environment). RAK is witnessing a significant influx of population on the various properties made available on the coastline. The reasons behind our decision to select Dubai: it is unthinkable and inconceivable not to be present in Dubai. The city’s highly ranked status as a globally recognized business hub and the metropolis state of the art infrastructure is certainly the driving force in its popularity. Presenting and proposing our products to an ethnically diverse population with a multitude of expatriates from different corners of the world. 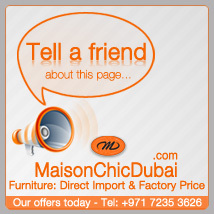 maison chic is a registered brand, and we certainly look on growing further our network in the UAE. The company is extensively using the Internet as a marketing tool, our sites have been developed and the referencing from the Big Three, “Google – Bing – Yahoo” is already remarkable. We are planning to introduce in the long term as well an e-Catalog, virtual shop, and live update for tracking upcoming containers in open seas. We frankly see a definite growth pattern in the sector of solid wood, well finished furniture, where the wood grain magnifies itself; the trend also calls for composite mixed medias/materials; it also covers the use of recycled wood, in particular teak, with a high respect for nature conservation. The market is definitely focusing on value for money. Our production fits exactly a particularly competent connoisseur demand and our motto “Furnish Better Live Better” incorporates accurately the whole concept of our business and products. Our Chief Executive Officer and Owner of the company also co-Founder of PT. ALMI Furniture Perdana, our parent company in Indonesia. She is undoubtedly maison chic's driving force with great negotiating and communication skills very open minded and flexible character, always prone on simplifying problems. Her intuitions and amazingly focused sharp responsive reactions help us counter measure different events, on positive outcomes. Her inner positivity and honest believes makes her the center core of the whole organization. The Owner of PT. 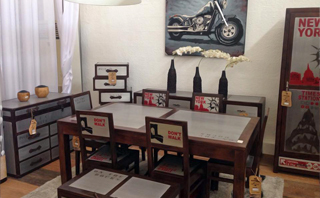 ALMI Furniture Perdana, parent company of maison chic's in Indonesia. He is the artifice behind the scene of the whole project, from ground level, in full consideration of the technical and organizational aspect of the business. He is gifted with proficient managerial skills, great organizer, relentless workaholic and accomplished motivator. His engineering background gives him a very practical systematic and methodical synergy in problem solving skills and techniques. Profoundly enticed and fascinated by innovative technologies applicable on enhancing the overall aspect of the business. He enjoys fully his job with an amazing capacity of transmitting his own personal sensations. He utterly believes on an honest and dedicated teamwork approach. He is very contagious on trailing you in his endeavors and envisioned direction. The General Manager part of the organization since the conception of maison chic's from the early stages. He is known for his hard work ethical values, inexhaustible captivating spirit, duty focused and detail oriented, technology savvy, always looking for a practical application of innovative technologies to enhance the business. Remarkable multi-tasks versatility and adaptability. Meticulous personality prone to new marketing approaches. Excellent communication skills very keen in building and preserving a strong steady professional relationship with customers complemented by the ability to meet and exceed his own goals. His exhibition portfolio consists on participation on furniture shows, like the renowned IFFS International Furniture Fair in Singapore and International Furniture Fair in Dubai, UAE his experience was boosted from additional exposures to numerous business related trips to Indonesia. Our Sales Manager for the RAK Main Showroom. Duty focused, always been a high performance employee, company dedicated strong point very honest constantly obsessed on maintaining a clean and pristine environment. Amazing team player highly appreciated by all co-workers and customers. Incredible natural skill on arranging displays. One of the most valuable asset of our organization. Our Main Storage Facility Responsible and Finishing Expert. 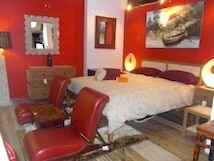 Latest inclusion although part of the first pioneers of maison chic. He has been re-introduced to the team recently by personal choice and request to be relocated from our mother company PT. ALMI, in Indonesia. Dedicated and flexible team performer. Capacity of delivering fully and diligently during extreme stressful conditions. Good sense of duty and organization. AAA+ ( A triple plus) for our company. He is our Marketing manager, based in Indonesia with a background enclosing a vast experience in the furniture sector, from wholesale, to retail, to new product development and diffusion, introduction to new prospected market areas. He is a very persistent personality resourceful and inclined merely to practical solutions. Our highly motivated, knowledgeable and compliant Team of Sales Persons is comprised by Mrs. Selam Mamo, Ms. Fre Assefa, and Mrs. Maria Duenas, always ready on standby dedicated to assist you on all your queries and needs. Our Technical Team is formed by highly qualified, skilled personnel with years of experience from our main factories in Indonesia, mostly specialists in joinery, carpentry, and color finishing. 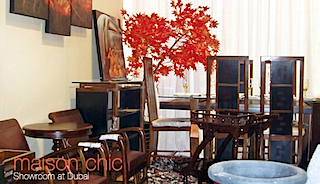 Margono, the team leader is a very versatile and resourceful individual; he joined maison chic in 2007. Our strong and competent Administration Team is headed by Mrs. Maria Duenas, extremely meticulous and powered with a great sense of duty. Since late 2008 Mr. Wisnu is the person in charge in designing, developing, marketing and maintaining consistently all our companies online related requirements. Mr. Wisnu is constantly looking for ways to create more traffic to our websites and in his unstoppable efforts in relation to Search Engine Optimization (SEO) and Marketing (SEM), he helped us achieve "First page search results" for relevant keywords on all the major search engines "Google - Yahoo - Bing". We definitely believe that the perseverance of Mr. Wisnu’s and his group of IT professionals, their commitment and continuous transformation and upgrades will eventually enhance the usability of our portal and ultimately increase the overall business revenue.